Entering into a new stepfamily or blended family is hard stuff. There is no way around how difficult it can sometimes be to see that everyone is on the same page and functioning in a healthy way. Research says that it takes 5-7 years for blended or step families to function like a biological or nuclear family. In some instances, the new family will never full develop into something that looks exactly like the biological family. 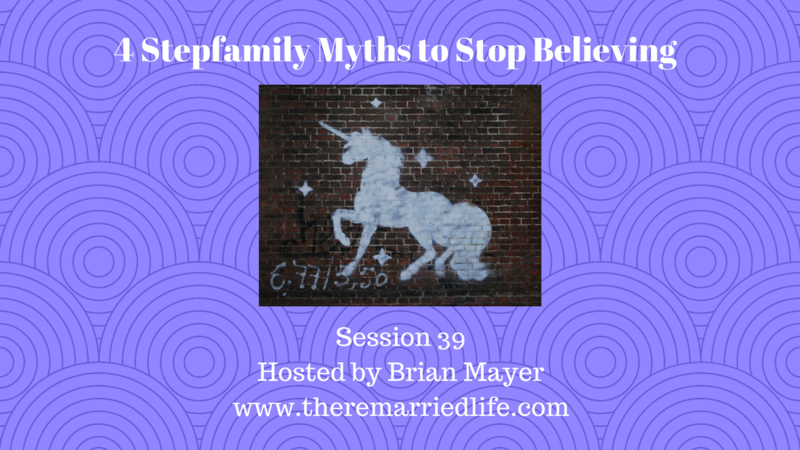 Today we will talk about 4 Common Myths that many of us believe about stepfamilies. These myths are discuss in the Prepare Enrich program for couples. I use this program in my couples counseling and coaching to help couples work through all sorts of practical areas of concern in their relationship. These myths are found in the Prepare Enrich workbook and I will attach a link in the Resource section of these show notes. Myth #1 – We love each other as spouses and so this love will flow down throughout the children. Do not be surprised if this bond and love takes time and as I keep mentioning it may never happen. This is not your fault. It is the situation and the different life that the children have been placed. Myth #2 – This marriage will be better. The goal should always be that you will do better this time around. You will have learned from your mistakes of the past and you will know what to do and what not to do. The problem is that as humans it can be hard to break out of the patterns from the past. The best thing you can do is recognize them and then slowly begin to work them out of your life. Myth #3 – The children will feel happy just like we do. Again the hope is that they do and a small percentage will actually be happy. However most children feel disoriented and sometimes downright resentful of this new situation. It will simply take time for children to become accustomed to the new normal and settle into new routines and patterns. Myth #4 – The stepparent and stepchildren will quickly bond just as a biological parent and child would. As a stepparent there is certainly anxiety about doing all you can to increase the bond. Additionally stepparents sometimes will completely begin acting like a biological parent by immediately giving the child expectations and disciplining. This is a mistake to do this too quickly. A trusting relationship should be developed first. Only thing can you begin to enforce rules. One important thing to do those is have unity with your spouse on these matters. The worst thing to do is hang each other out to dry by showing the kids you have different perspectives on expectations. Take it slow and reduce your internal expectations of what you will see unfold. This will help reduce your stress and anxiety to make this work. Just relax and try to have as much fun in the present moments which are moments you cannot get back. Stop feeling guilty and shamed over the past and worrisome and anxious and live the satisfaction of this present which is all we really have. You can do this, I know you can. Patience and Perserverance in everything you do by creating stability, consistency and structure. o Prepare Enrich Workbook for Couples: This workbook is loaded with lots of great exercises for you to do with your spouse to increase your bond and live the kind of marriage you want.